To answer that, I used what we learned from Ilyas and Duck Search for Allah, and told her that Allah is all around us, and we can feel Him because of everything that he has created. We can’t see Him, but we know that He is there. I wanted to take that one step further and talk about how close Allah (SWT) is to us. To start, we talked about blood. My daughter is fascinated by blood, probably because she always gets a pretty bandage if she bleeds. We started by discussing that there’s blood inside our body, a lot of blood. Blood is how the air that we breathe and the energy we need travels throughout our body. Our blood goes from our head to our feet, from our right side to our left side. Inside our body, we have “roads” for the blood to travels called veins. If we didn’t have veins, then we wouldn’t be able to do anything. Our brains need blood to work. The vein, the highway, that is used to get blood to our brain is called the jugular vein. Allah has said that He is closer to us than our jugular vein that is inside us. NO ONE else can get that close. No one can be so close that they are inside us, except for Allah. Go outside and have each child collect a good-sized leaf. Examine the leaf closely to find the lines. 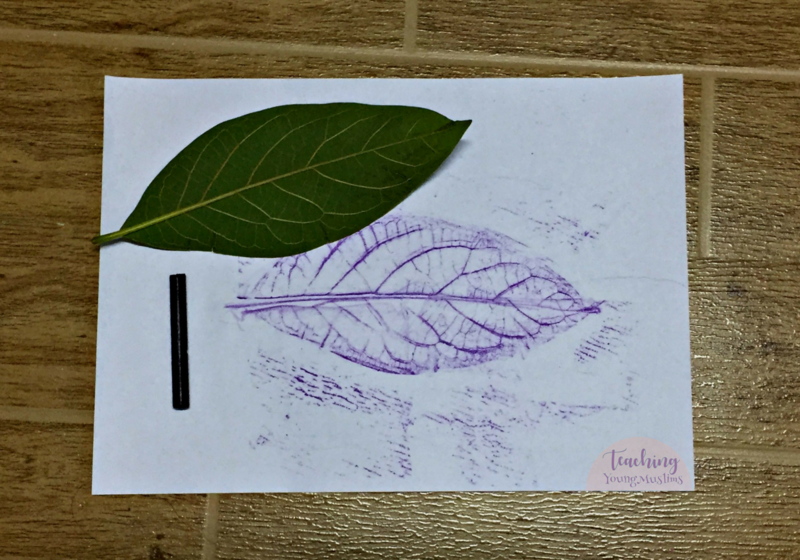 Place the leaf under a piece of paper, and rub a crayon sideways on the paper over the leaf. When you do this, the lines of the leaf’s veins will become clearly visible. The veins of the leaf are used to carry water from the trunk of the tree or the stem of the plant to all the parts of the leaf. The leaves than absorb energy from the sun to create “food” for the plant, and the veins transport this “food” back to the rest of the plant. Show the kids your veins, somewhere where it’s clearly visible, perhaps the hand or the arms. Ask them to find the same vein on their body. Ask them to describe the vein. Ask them to see if they can find more veins on their bodies – on their feet or on their arms. Some kids will have veins that are more visible than others – tell them that how much they can see depends on their skin, but they all have the same veins inside. Tell them that the jugular vein is inside their throat, connecting their brain inside their head to their heart that is hard at work every day, pumping blood. Have them to put their hands on their throat, and tell them to imagine a highway inside that is carrying blood to power their brains. And then tell them that Allah (SWT) is even closer than that. He is not far. He is always close.